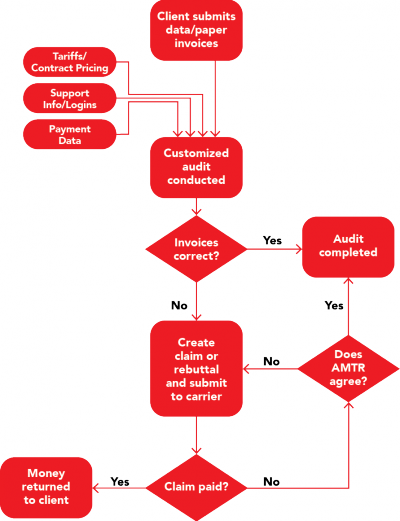 AMTR’s signature service is an After-Payment Freight Audit which focuses on freight records after payment has been made (either by the client, or by the client’s 3rd-party payment firm). The purpose is to discover and recover overcharges. Overcharges occur for a variety of reasons, ranging from simple clerical errors to complex rate interpretations. Our service never costs – it only pays! AMTR works on a contingency basis and as such receives a percentage of the overpayments we recover for you. We recover hidden overcharges that would otherwise be a permanent freight expense, helping to reduce overall shipping costs. Since 20% of a typical client’s invoices contain some type of error, and 1% to 5% of those involve recoverable monies, the savings can really add up!